Do you feel anxious and a little out of sorts when life gets busy? The number one thing that has helped me is having routines in place. Having a schedule makes family life predictable and less stressful. Don’t get me wrong, I do enjoy a little spontaneity from time to time, but in general, I like the idea of our family running like a well-oiled machine. It has helped me so much in my mommy adventures. The kids know what to expect and what is expected so, bonus– they have less anxiety too! Drink more water (and less caffeine). Being dehydrated will make you tired, irritable and anxious. Try toting around your water bottle everywhere you go and see how many times you can fill it up, each day aim for a little more – sip, sip away! (This is my favorite water bottle). Water is vital to detoxification and overall health of your internal organs, so drink up! Clean Sweep before bed. Before you and the family call it quits for the night, take about 10 minutes and have everyone help put things in their place. You may get more accomplished and less flack if you assign everyone a task, like wiping down counters, folding blankets, picking up toys, nothing out of place in the living spaces of the home! The next morning you wake up without the stress of clutter and start your day anxiety free. Make a To Do List. You can use your phone to make a “to do” list or if you’re old school like me and like the art of checking things off, use a small pad of paper. Keep it in the same place all the time so you can go to it every evening and write down your list for tomorrow. OR I use a bullet journal these days, and always have it with me. It has been so helpful at keeping me organized and creative! I highly recommend giving a bullet journal a try if you haven’t yet. They can be as simple or complex as you’d like, mine’s pretty simple. Overall, having a list helps you feel more in control and less anxious and forgetful! Stretch. Give your body some love and stretch. Maybe it’s while you’re watching TV at night, maybe it’s before you crawl into bed, but stretch! Whatever feels good. Try a quick yoga sequence or something as simple as neck rolls and arm stretches. Stretching is a great way to release stress and anxiety, not to mention will help you be more comfortable as you sleep. Go to Bed Early (and without electronics). Do you get 7-8 hours of sleep? If not, aim for getting that tonight. Shut the electronics down an hour before you plan to sleep to give your body and brain a break from the “blue” light. This is a great time to do a few of the things listed above. Read a book, or do a simple meditation before bed, and soon you will be drifting off to a peaceful rest and less anxious tomorrow. Hi there, I’m Angie, as a Health Coach, I’m making it my priority to help busy moms, like you, have the happiest, healthiest family on the block! I’ll teach you how to incorporate essential oils, whole foods, family fun, and self care into every day! You won’t find anything complicated here, it’s all very simple, fun, and motivating! Thanks for allowing me to be part of your journey! Receive a Meal Plan for a Whole Month of Simple, Healthy, Kid-Approved Family Meals, when you sign up for my newsletter! I will also share with you, my Spring Cleaning Calendar, complete with 5 of my favorite Essential Oil Cleaning Recipes! 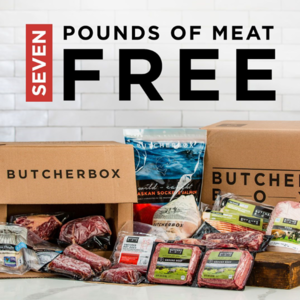 I highly recommend Butcher Box! Check out this month’s special!